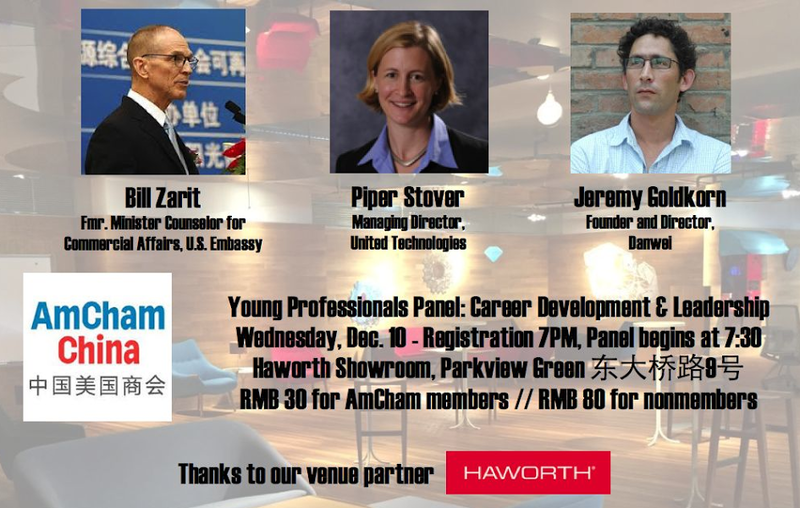 Bill Zarit, former Minister Counselor for Commercial Affairs at the US Embassy and incoming governor on the AmCham China board, Jeremy Goldkorn, Managing Director of Danwei, and Piper Stover, Managing Director of United Technologies Management, will speak to our young professionals on developing their careers in China. These three prominent panelists will offer insight to those wanting to enhance their China career and leadership skills. The Young Professionals Committee is a working group within AmCham China where young professionals can build their personal and professional networks, develop career skills, access cultural events, and work with other young leaders to achieve success both personal and professional. The goal of the committee is to help young professionals in their career development in Greater China through inspiring speaking events, horizon-expanding cultural events, networking events, and opportunities for learning and collaborating in diverse areas of business.